I am reliably informed that people don’t want to hear about sin. As my niece’s priest pointed out, that’s odd, because they certainly have no trouble committing sins. Nevertheless, if your preacher and I (and any other Bible teachers you may have) are doing our jobs, we are occasionally going to be warning you about your sin. We have several motives for this. Talking about your sin is much more comfortable than talking about our own sin. We really do care about your sanctification, which gets off track every time you commit a sin. Finally, if we don’t warn you about sin, God holds us personally responsible – along with you – for your sins. It is this final point that we read about today. Maybe over the next few weeks when you get really, really tired of hearing about sin, you will remember God’s instructions to Ezekiel and cut me a little slack. Assorted wits who feel strongly about their property rights have posted signs saying, “Prayer is the best way to meet the Lord, but Trespassing is faster.” There are a variety of ways to commit a sin, but (aside from worshipping other gods) trespassing against Gods’ law is without question the fastest and most reliable method. I imagine God was especially exasperated with whoever asked the questions in Jeremiah 16:10. They sound like a bunch of kids: “What?! Why are you yelling at me? What did I do?” – this after you have told them 16 times to knock it off! Read the book! The rules are right there, and if you follow them, you will live. If you don’t, it’s a sin. Very simple. Remember Asaph? He was an important musician who wrote twelve of the psalms recorded in the Bible. He worked during the time of David and Solomon, centuries earlier than the prophets Ezekiel, Jeremiah, and Nehemiah, whose works we read from earlier this week. Like them, he equates breaking God’s law with sin. John points out that “Love!” is the old commandment, as we saw a couple of weeks back in Deuteronomy and Numbers, and it is the new commandment, as we saw in Matthew. He reminds us of this “so that we may not sin” by breaking the two great commandments about love. Most of the instruction in the New Testament focuses on Christian behavior. John’s books don’t. John’s attitude is that if Christians love God, love other Christians, and love non-believers, bad behavior will never come up. My little children, I write these things to you so that you may not sin, but if anyone does sin, we have an advocate with the Father, Jesus Christ the Righteous. He himself is the propitiation for our sins, and not just for ours but for those of the entire world. This is how we know that we know him: if we keep his commandments. The one who says, “I know him” and does not keep his commandments is a liar, and the truth is not in this person. But whoever obeys his message, truly in this one the love of God has been fulfilled. This is how we know that we are in him: the one who claims to remain in him ought to behave exactly like he himself behaved. Beloved ones, I’m not writing you a new commandment, but an old commandment that you had from the beginning; the old commandment is the message that you heard. But again, I am writing you a new commandment, which is true in him and in you, because the darkness is passing away and the true light is now shining. The one who claims to be in the light and hates his brother is still in the dark. The one who loves his brother remains in the light, and he sets no trap for anyone else. But the one who hates his brother is in the dark and behaves as if he is in the dark: he doesn’t know where he’s going, because the darkness blinds him. 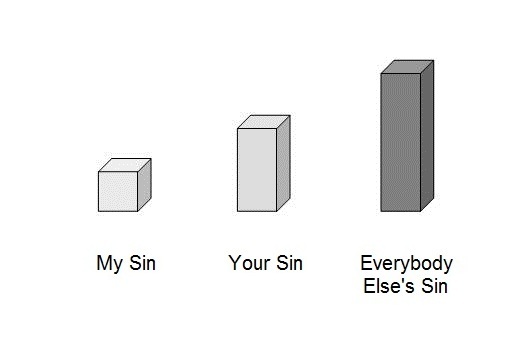 God’s view of sin is that all sins are the same size, and they are all pretty black. And by the way, James also says that not keeping God’s commandments is a sin, just like the other Biblical writers we’ve read this week. My brothers and sisters, do not play favorites with people if you have faith in our glorious Lord Jesus Christ. Let’s say a man enters your church wearing gold rings and an expensive suit, and a poor person in torn clothes. If you look up to the one wearing the suit and say, “You sit here in the front pew,” and you say to the poor person, “Stand over there,” or “Sit here on this folding chair,” aren’t you passing judgment among yourselves, and being judges with evil thoughts as well? Listen, my dear brothers and sisters, didn’t God choose the poor in the world to be rich in faith and to inherit the kingdom that was promised to the ones who love him? But you dissed the poor! Don’t the rich oppress you and drag you into court? Don’t they blaspheme the good name by which you are called? Nevertheless, if you obey the royal law according to the scripture, “Love your neighbor as yourself,” you do well. But if you play favorites, you commit sin, being convicted under the law as violators. Whoever keeps the entire law but commits one little offense has become guilty of everything. Because the one who said, “Do not commit adultery,” also said, “Do not commit murder.” So if you don’t commit adultery, but you do commit murder, you have become a violator of the law. Speak and act like people who are to be judged by the law of liberty, because judgment without mercy will come to the one who shows no mercy. Mercy rejoices in overcoming judgment.